Nearly 11 months have passed since Amrita SeRVe was officially launched during Amma’s 60th birthday celebrations. Village clusters have been identified in 27 states of India and work has begun in the seven focus areas of Health, Education, Water and Sanitation, Agriculture, Eco-Friendly Infrastructure, Income Generation and Self-Empowerment. Many activities are ongoing in all states. Below we provide a snap shot of some of these activities. In Sawai Madhopur district in Rajasthan, as in many other parts in India, women will often not sit on a chair when men are present. They will keep their faces covered with veils. Amrita SeRVe is endeavoring to empower them through forming self-reliant groups or SRGs that will tackle problems in areas of Health, Education, Agriculture, Water and Sanitation, etc. In rural India, there are few doctors and nurses. In our villages in the Kondagaon district of Chattisgarh, as in some other states, trained health workers are now regularly conducting medical camps. Training at the Amrita Institute of Medical Sciences will empower more SRG members focusing on health so that they can themselves solve basic problems in the community. Open defecation, where it exists, contaminates the environment and causes many health problems. And where toilets exist, often the waste water ends up polluting water bodies. Our goal is to address these issues as we begin to solve the problem of sanitation. In our villages in Khurda district of Odisha and in some other states, the quest has already begun. In many rural places, women and children have to fetch water from faraway places. In our tribal villages in Wayanad district in Kerala, for instance, people needed to haul water from the bottom of a hill for their daily needs. Now wells have been dug and Amrita SeRVe has made arrangements to bring relief to this community. Planting trees, making check dams, and digging ponds – all these help to harvest rainwater and recharge ground water. In Ransai village in Maharashtra, the goal is that the well that now dries up during the summer season will have water all year long. The first step is to raise awareness, so that all villagers enthusiastically come together and participate in watershed projects. Raising awareness is also the first step to making the transition to organic agriculture. Farmers from many of our villages, such as in Uttar Pradesh and Gujarat, are being trained to adopt natural ways of farming. How wonderful it would be, if the whole village completely stopped the use of expensive and harmful chemical fertilizers and pesticides. Over 30% of the people in Bihar are illiterate. The Amrita SeRVe education team is committed to changing that. It is focusing both on adult literacy and back-to-school camps especially for children who have recently discontinued studies. For those in school, free tuition support is being provided so that they may do well in studies. Free tuition classes are also on going in Madhya Pradesh and many other states. The tuition teacher is often a young graduate from the village itself, and sometimes has students from many different classes. Innovative learning programs on tablets help as the students are empowered to learn together in groups and on their own. For youth who have no jobs, Amrita SeRVe is providing support through vocational training. 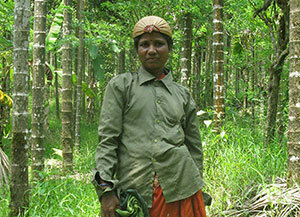 The goal is to check migration and provide opportunities for income generation in the village itself. Using local resources and making value-added products, especially from agricultural produce has begun in our villages in many states such as Tamil Nadu and Karnataka. In villages such as Udalaka and Asthal in Uttarakhand, Amrita SeRVe is continuing the work of the post-disaster reconstruction and relief teams … re-building communities and lives. Several people from these villages met Amma for the first time when they traveled to Amritapuri during Amma’s 60th birthday celebrations. 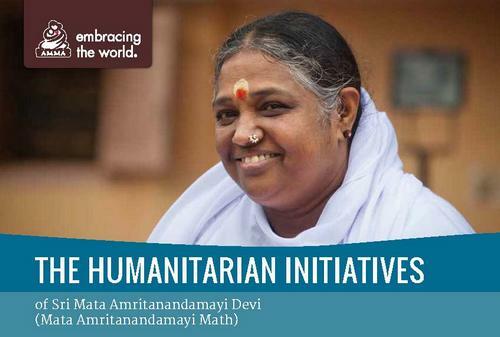 Amma continues to remain a strong presence in their lives. “I have only one desire now – to meet Amma soon,” say others, like Neetu Devi. 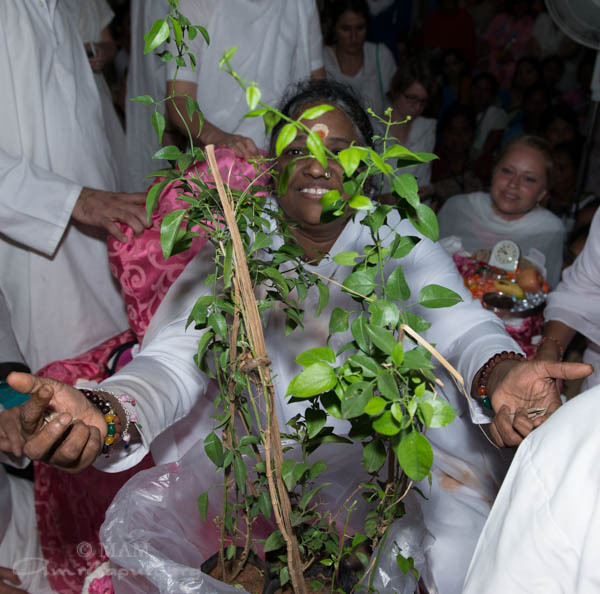 Perhaps the opportunity will come soon – during Amma’s 61st birthday celebrations. Amrita SeRVe is now serving in 27 states of India. 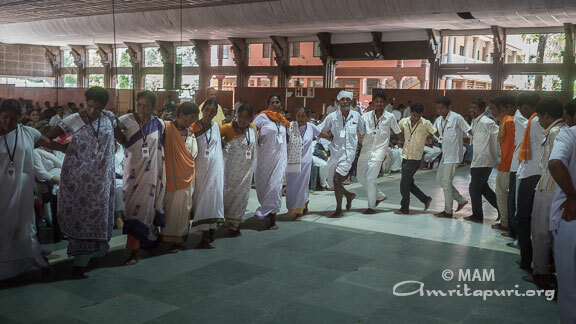 Villagers everywhere are making plans to come to Amritapuri for Amma’s darshan. 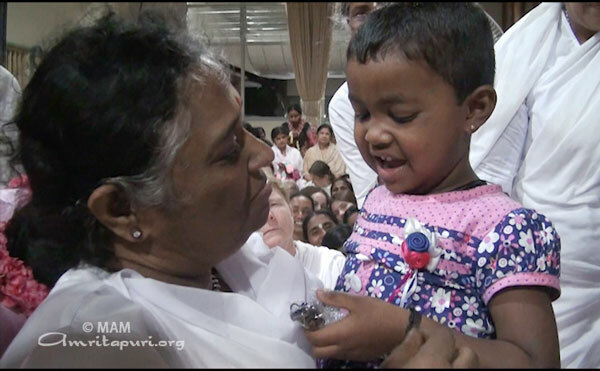 The miracle of Amma’s love is starting to change their very lives. When Amma visited Ranchi in Jharkhand in 2006, the villagers in Dev Gain met Amma for the first time. “Not a day goes by when I don’t remember Amma,” says Bharath. Today Bharath coordinates all Amrita SeRVe activities in his village, chosen as one of Amma’s 101 villages from all over India. 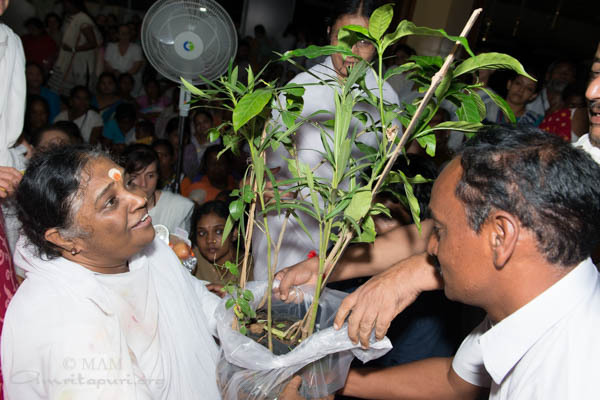 Amma encourages us that we should re-learn to grow our own vegetables. Teaching this knowledge to our children certainly has a great influence on our future. 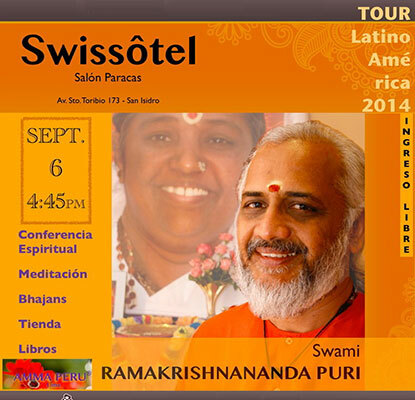 Amma Center, Switzerland held a seminar this summer to do just that. This seminar followed permaculture principles taught by Anselm Ibing and Nirmala Iser. An enthusiastic crowd of interested adults and inspired children learned in theory and practice, what is meant by Permaculture and how it can become a part of our lives. With ideal weather, the adults and children learned how to create a flower bed, how to plant the flower seeds; how to make compost and worm compost; how to build shelters for bats, how to build wind turbines for the expulsion of rodents in the garden and how the rain water on the property can used better. All participants were able to go home satisfied and inspired. And the Amma Center now has a new compost, worm compost, bat houses and many windmills in the garden. Amma: There is nothing new about war. It has been happening since the beginning of creation. But we must realize war is man’s creation, not God’s. God is patience, love and compassion. In God, there is no dvaita bhava [no feeling of something other than one’s self]. There is only love for all beings. It is because people lack the proper understanding about God that there is war. We cannot blame God for something we created. Once a drunk-driver caused a horrible accident. The police started to haul him away. The man protested, “Hey, why are you arresting me? I didn’t do anything. It was because of the petrol that my car lost control.” We shouldn’t be like this, blaming God for our actions. As we take what we need in our daily life, we should remember all the innocent people suffering from the violence of war and terrorism–the children who have lost their parents, the parents who have lost their children, the maimed and injured… The pictures we see on the news of mothers crying over the dead bodies of the children are too much to bear. But we cannot bring back the dead. We can only pray that their souls find peace. The ones who really need our prayers are those left behind. Let us pray that they gain the peace and mental strength to move forward in life. We cannot say what change we will be able to bring about, but we should try. Spiritual understanding is what is needed: Take only what you need, give the rest to help others and understand the nature of the world. Amma is trying to bring about this understanding in people. If you plant 100 seeds, maybe only two will sprout. If you plant 1,000, maybe 10. But that itself is a change–isn’t it? 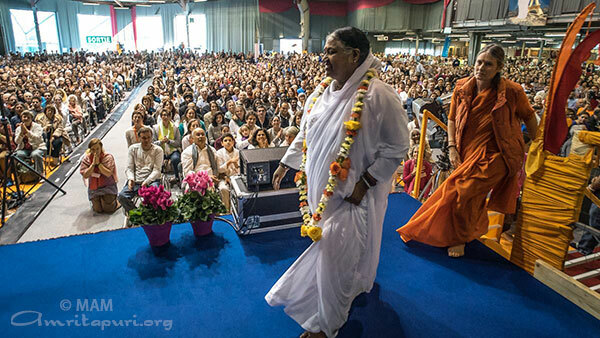 Amma will be visiting 9 European countries starting from October 7 to November 17th. 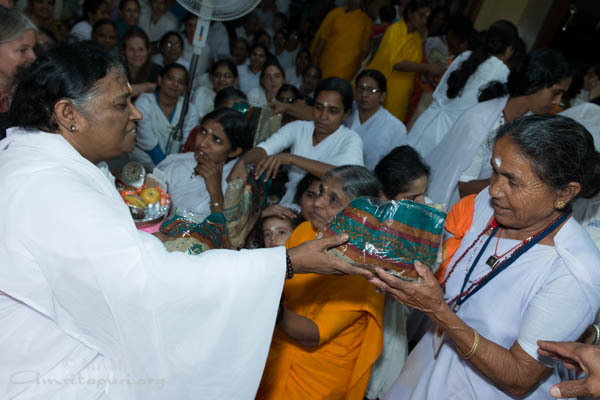 This past week more than 70 tribals and villagers from remote areas — all living below the poverty line — came to Amritapuri Ashram for Amma’s darshan. 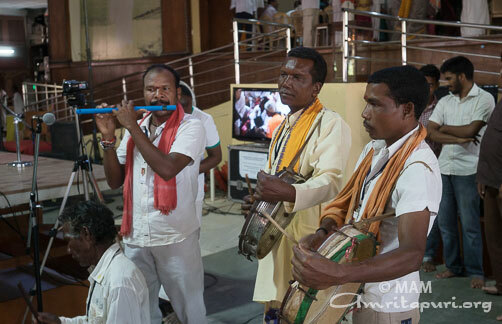 Inspired by Amma’s efforts to uplift the remote village populations throughout India, devotees and ashram residents helped to bring the villagers here to meet Amma. Feeling compassion at the sight of their innocence and deep economic plight, Amma offered 20 of them — who had come from Eastern Kerala — employment at Amrita Hospital in Cochin. There, they will receive free room-and-board as well as salaries for assisting in offices, delivering meals to patients and serving as orderlies. Amma also offered to sponsor the higher education of one girl who, having recently completed her 12th standard studies, was amongst the highest educated in her village. Many of the villagers had never left their panchayats (villages) before, not even to go to nearby cities. Having never interacted with the world outside their village, the tribals from Dummiragunda Mandalam (Visakhapattinam District, Seema Andhra) even had to be shown how to dress in a manner suitable for modern society. They also had to be taught how to use showers and toilets at the ashram, as they had no previous experience with such amenities. In fact, because their village’s nearest source of clean water is three kilometers away, they were not even used to regularly bathing. Much of the poverty and lack of resources in villages like these stems from their remoteness. With schools providing education beyond 7th standard being as many as 50 kilometers away via forest roads, few are able to attend. When a husband and wife from Kallar (near Adimudi in Idukki District, Kerala) came for Amma’s darshan, the husband complained to Amma that his wife was so obsessed with cleanliness that she forced all their guests to take a bath before entering their dwelling, and she would spend hours in the bathroom washing her hands. He told Amma that he thought she was arrogant and he had begun twisting her arm to try to stop her behavior. Amma explained to the man that the woman must be suffering from an obsessive-compulsive disorder. Amma then arranged for the woman to see a psychiatrist at Amrita Hospital and get the care she needed to treat the disorder. 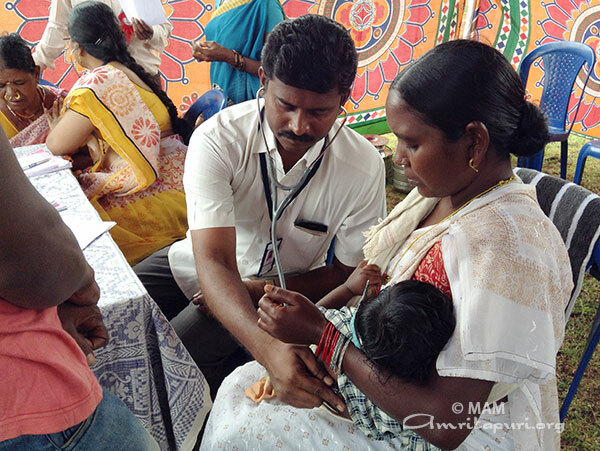 This past June, devotees had already arranged a medical camp in Badimela (Visakhapattinam District, Seema Andhra), with doctors providing totally free checkups and medicine there for more than 500 people. On August 27th, a similar camp will be held with doctors from Amrita Hospital in Kattamudikad (near Munnar, Idukki District), the home of another group of villagers who happily visited Amma this week. 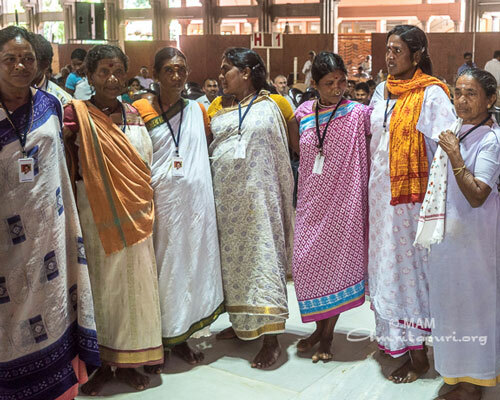 “Even though many of them lack education and are not civilized by our standards, they have the culture of spirituality within,” Amma said, as she watched the group from Badimela offering a tribal dance during darshan. 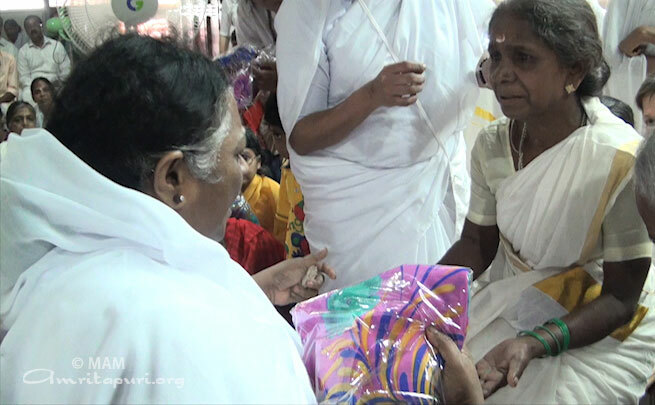 Afterwards, Amma lovingly embraced every one of them and personally handed each woman a brand-new sari and each man a brand-new shirt. 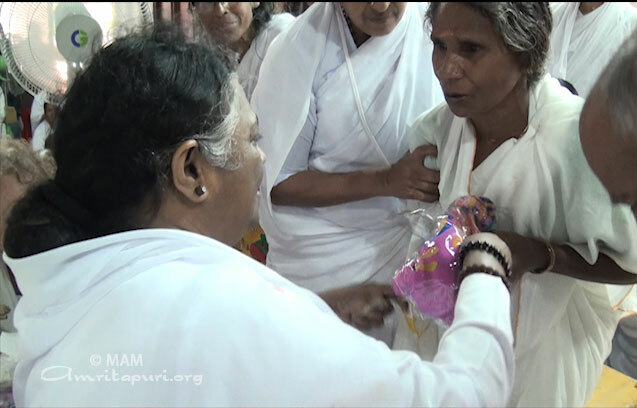 The organizer of the villagers’ trip presented Amma with indigenous seeds and plants from the tribal regions. More such villagers from Mankulam Puram (near Munnar) will arrive tomorrow. 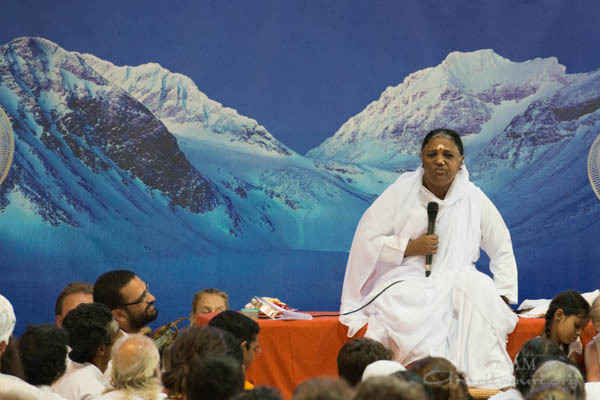 Right in the centre of the Netherlands, close to Utrecht and the venue where Amma’s annual program is held, is the new Amma Centre of the Netherlands. It’s a two-acre property . 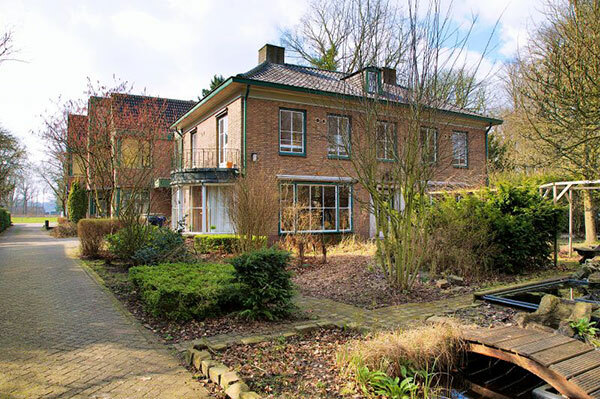 A 1940s-era villa with an extension added more recently, this Center houses two large satsang rooms and more than 20 smaller rooms. 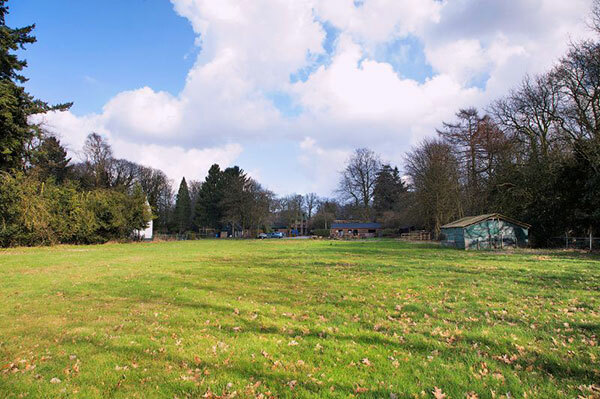 It’s situated within an hour from Amsterdam and the airport, and is only 800 meters from a railway station, making it very central and convenient for devotees to come for satsang and weekend retreats. 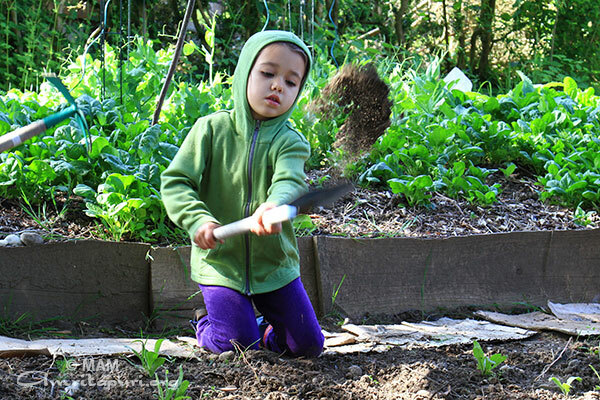 In the spacious gardens, a permaculture fruit and vegetable garden will be cultivated. 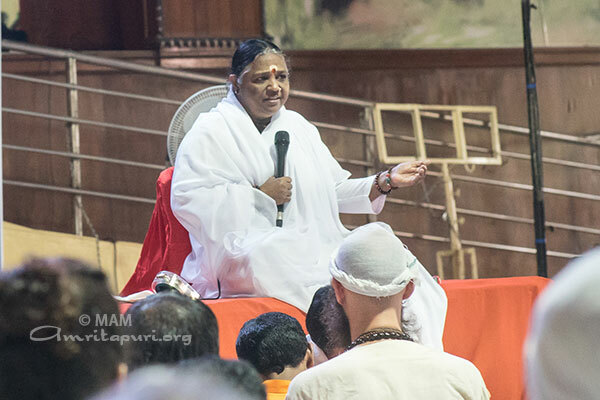 Yesterday, after meditation, Amma was asked a question about how to love without expectations like Amma does. The following is a short excerpt from Amma’s detailed answer. Amma: Human birth is meant for realizing our oneness with God. Yet, during the course of our life we develop so many attachments. These attachments give rise to expectations. And when those expectations are not fulfilled, sorrow, anger and the desire for revenge result. When two people fall in love, they rarely understand each other’s hearts. They don’t understand that, just like they are, the other person is also seeking love. Really, both of them are like beggars, begging for love. They each desire love, yet neither of them is willing to give love. This leads to problems in the relationship, even divorce. Remember, they are not jnanis [knowers of the Self]. They have not studied the scriptures. We should understand the nature of people and the objects of the world. For example, we know that if we touch fire, we will get burned. So, we are very careful when we handle fire. We should have similar awareness when it comes to relationships in life. If we dedicate our life to a higher purpose, such as realizing God, then all attachments will wither away and fall off. God is a state wherein there is no duality. When there is only oneness, where is the scope for attachment or non attachment? The essence of Sanatana Dharma is to see Narayana in nara–to see God in all of humanity–and serve Him. You will also come to this state. In connection with the Sanskrit Week Celebration of CBSE schools, Amrita G Nair of Amrita Vidyalayam, Delhi, got the first prize for Delhi region. Amritavarshini S of Amrita Vidyalayam, Vadakara, got the third prize for Thriuvananthapuram region in the Laghubhashanam (short speech) category. The prize consists of a certificate, a medal and a cash prize of Rs. 5000/- and Rs. 2000/ respectively for first and third positions. Union Minister, Smt. Smriti Irani gave away the prize in a function held at Delhi on 13/08/2014.